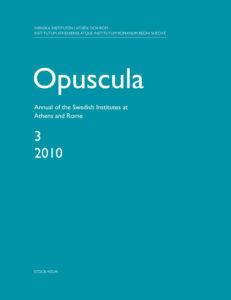 Opuscula 3 (2010) is now available for purchase and free download at Bokorder.se. Also available at Amazon.com, Amazon.de, Bokus.com, and Adlibris.com. This paper begins with an overview of the bronze headbands from the prehistoric (Late Bronze to Early Iron Age) burial tumulus of Lofkënd in Albania, which were found among the richest tombs of the cemetery, all of them of young females or children. It is argued that these individuals represent a class of the special dead, those who have not attained a critical rite de passage: marriage. In their funerary attire these individuals go to the grave as brides, married to death. The significance of the Lofkënd headbands is reviewed, as is their shape and decoration, but it is their context that contributes to a better understanding of Aegean examples, including the many bronze, gold, and silver headbands found in tombs from the Early Bronze Age through the Early Iron Age, as well as those dedicated as votive offerings in sanctuaries. In addition to discussing the evidence for headbands in the Aegean and much of southeast Europe, this paper also attempts to uncover the word used in this early period in Greece for these distinctive items of personal ornament. In memory of Berit Wells.